For the past five years Coldwell Banker Riveras (CBR) has managed their property listings in a custom application built by etainia, but in need of a technology update to take if our of Flash. 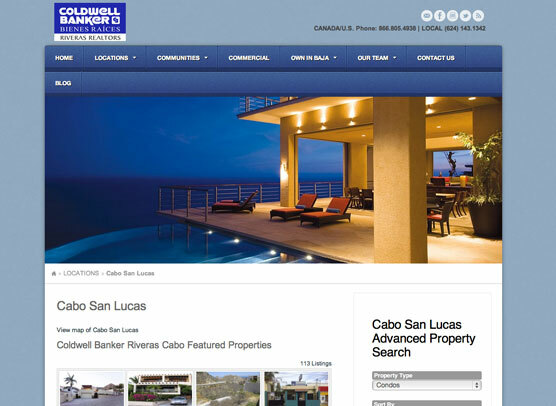 Since we launched the original site, they also began using an MLS website service that covered southern Baja and all of most of their markets. Etainia leveraged the WordPress plug-in developed by their MLS listing service and integrated into a new responsive website that gave their customers multiple ways to search properties for sale. While providing a featured listing page, the site also shows listings by city or region, displaying the agents responsible for each market alongside relevant properties. An “Our Agents section provides the full list of their agents with links to their profiles which also contain each agent’s listings. The MLS listings details display with the CBR website with full-size slideshows and all the property details available. Prospects can send an email directly to the sales team from the listing or use one of the many contact forms in the website to inquire about specific properties. To feature selected properties that have compelling photography, the main image on the home page and listings page rotates through several featured listings that link directly to the property’s detail page. Etainia has also managed a separate blog for CBR and because it is very successfully ranked in the search engines on a variety of important search terms, we decided to keep it as a separate site, but match the look and feel and functionality of the main website.